On May 13, Becton Dickinson announced that they received FDA approval for a new insulin pump infusion set. Infusion sets are how insulin gets delivered between my pump and my stomach – a small cannula sits in the skin of my stomach, attached to a tube that pulls the insulin from the pump. Although there have been impressive developments in pumps, glucometers, lancets, and most other diabetes supplies, infusion sets have not changed much at all since they first came into being 30 years or so ago, so this is pretty exciting news. This new infusion set apparently causes many fewer occlusions (when a blockage in the tube or cannula prevents insulin from being delivered properly), and is “designed to reduce insertion pain and trauma”. The very next day after my dad told me about this announcement, I stood in the bathroom, prepared to change my old school, decidedly not redesigned infusion set, as I do every 2-3 days. I pulled the cannula from my stomach, and, disconcertingly, the little 9 mm tube was followed by blood. Like…kind of lots of it. 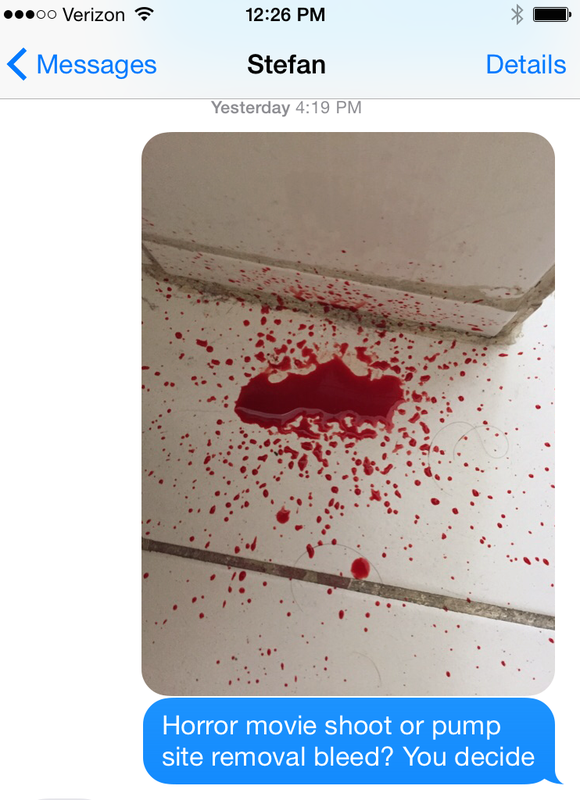 It trailed down my stomach, then kept going, this long line of blood that went down my thigh, then calf, then began splattering on the bathroom floor. I watched, fascinated, as it streamed down. Drip, drip, drip. I stepped in it, left a bloody footprint. Like a true millennial, I didn’t immediately grab toilet paper to stop the bleeding, but reached for my phone to document its grotesquerie. I’ve had pump sites bleed before, but this was the worst. I’m completely fine; just bruised, but it did give me a new appreciation for what a new, “less trauma” infusion site might provide. I am constantly reminded of how freaking lucky I am to have been diagnosed with diabetes in 2014, rather than 1994 or 1974, or, god forbid, 1914. I truly don’t know how people used to do it before – these days some of the technology STILL feels so dated, archaic, clumsy and frustrating that being reminded of how far we’ve really come definitely helps with some perspective. And it certainly gives me hope for what the next decades will bring. In the meantime, here’s a picture of my blood, because, you know… gross!